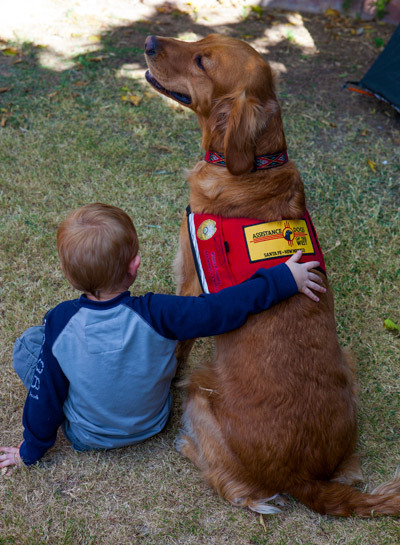 Since 1995, ADW has placed more than 300 service dogs with client recipients requiring individual and family support for mobility impairments, autism spectrum disorders, developmental disabilities, seizure disorders, diabetes, post-traumatic stress disorder and anxiety disorders. In our 2014 graduating class, 12 dog-client pairs reflected the whole-systems impact of our program on families. Assistance training is among the most demanding fields of dog training. 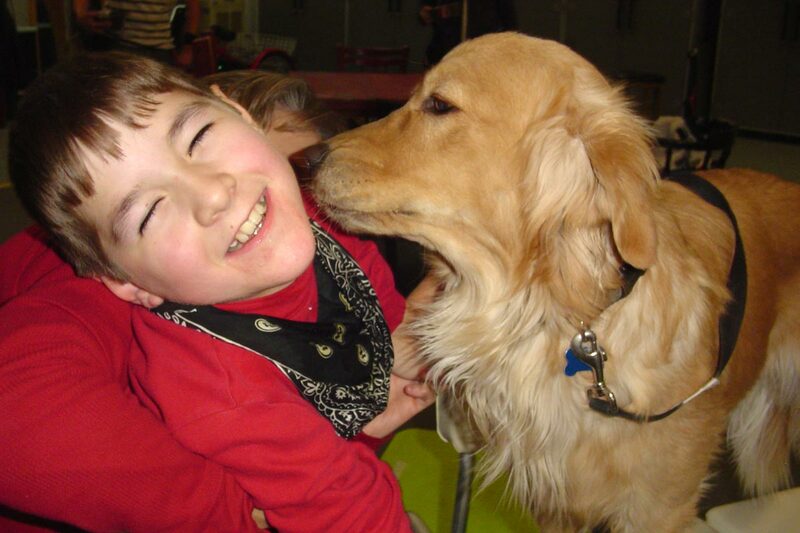 To serve clients with disabilities, dogs must be skilled in a variety of behaviors. They must be able to perform simple and complex tasks in virtually any environment. Their very high level of proficiency must include the ability to respond promptly and accurately to verbal cues alone or to physical cues alone. The dog must be able to ignore any distractions, even those that are most intense, and to be creative and flexible as needed. By the time ADW dogs are placed with clients, the dogs have been positively reinforced hundreds of times for each command by dozens of different trainers, including student trainers, in a huge number of locations. As each dog develops, we invite him or her to show us individual talents and to choose his or her working path. We then begin to tailor the training to match the dog’s proclivities and abilities. At ADW, we permit our dogs to select their human partners and thus, to choose their life’s work. During the interview process, we watch the dogs as they interact with prospective clients. We like to see the dog showing signs of his or her desire to work for this person, choosing his or her new person over other rewarding opportunities and familiar trainers in the training room. We also evaluate the prospective client’s behaviors with the dog. A successful match creates a strong working foundation. We celebrate these partnerships at our annual graduation ceremony. ADW clients receive dogs who are ready, able and eager to perform tasks and to step fully into their working lives as service animals. We are very proud of our stellar record of client placement success since 1995. Since 2010, our Courthouse Dogs program has placed 26 dogs in criminal justice settings in New Mexico, Arizona, California, Texas and DC. 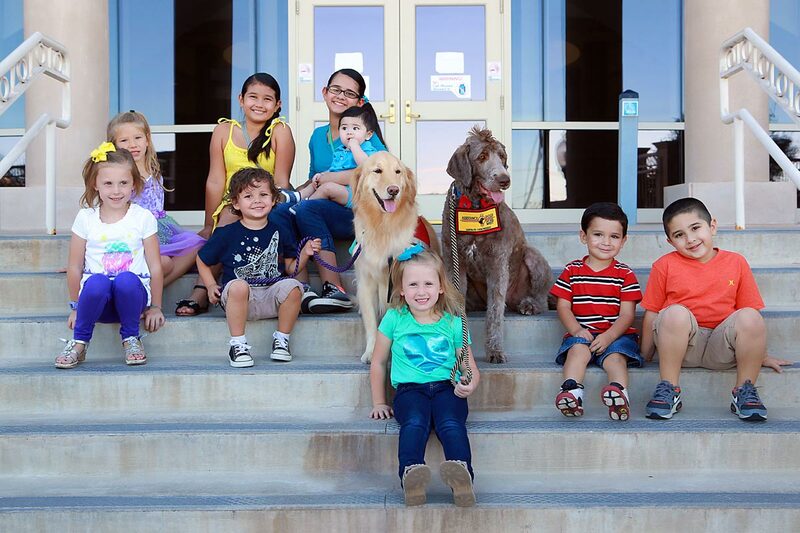 Courthouse dogs specifically work with crime victims, predominantly children, in helping to foster a safer and more comfortable environment as they provide depositions and give testimony in court. These dogs play a crucial role in easing stress felt by children in the court system, and often aid prosecutors to achieve convictions. Fifteen ADW dogs have been placed in the New Mexico court system and two in Arizona, six in California, two inWashington DC as FBI Crisis Response Canines and one in Texas. These dedicated canines also provide stress relief and cuddly empathy on the job to the special investigators, victims’ advocates, prosecutors, district attorneys and defense attorneys who are involved in the investigation and prosecution of domestic violence and alleged crimes against children. Warrior Canine Connection teaches warriors with psychological wounds how to train service dogs for other veterans with disabilities. The dogs are trained to provide mobility support and to offer constant, non-judgmental, healing companionship to minds and bodies ravaged by war. Veteran recipients of ADW dogs have served in Vietnam, the Persian Gulf, Iraq and Afghanistan. Seemingly miraculous transformations can occur when dogs paired with veterans help them to re-integrate into their family and community, and find increased belonging and acceptance. If a child is reluctant to go into an interview room- give him/her Russell's leash and off they go. A hyperactive child having trouble focusing? Help them "train" Russell to do a trick using soft voices, limited body movements, and staying focused. Try to explain to a frightened child that he/she will have to come back for a medical exam or victim meeting? No problem if Russell is going to be there.